There are so many different ways to practice yoga. I like to try different things aside from taking classes. I have applications on my devices, I’ve moved along with Youtube videos, I have created my own routines, I have just done what comes to mind, and I have practiced other ways. 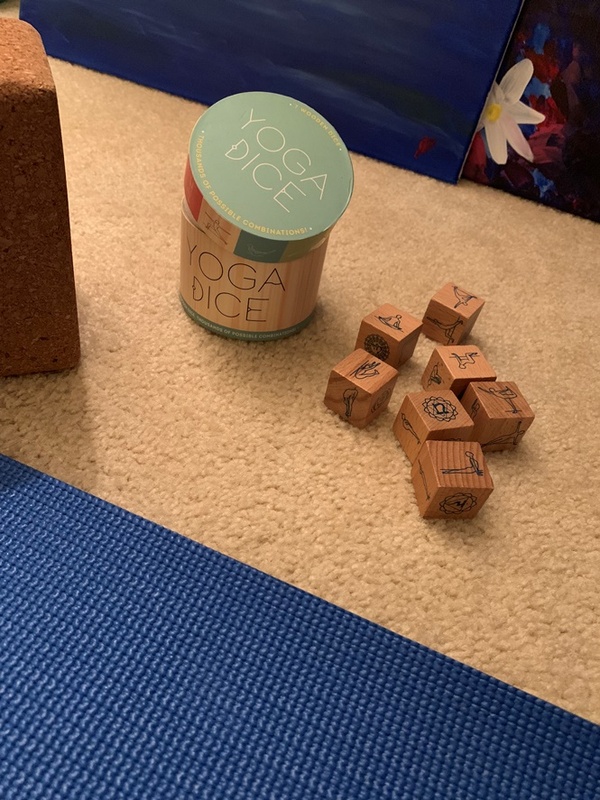 I recently purchased Yoga Dice. It is a fun way to do some poses. There are so many ways you can use the dice. Each dice has five poses and their related chakra on it. There are seven dice which you can just shake in the tub then roll out. I have been rolling out all the dice and then arranging them in the order I want to do each pose. Then I do all the poses then roll them again. I do this several times to end up with an hours worth of “routine.” When it lands on the chakra I just roll that dice again so it will be on a pose. In addition to the poses on each dice being related to a chakra the poses are also split up into types of poses. So one dice is Sun Salutation Poses, one is standing poses, one is balancing poses, one is seated, one is forward bends, one is back bends, and one is core poses. So you could decide to just do one or two types of poses and only roll those dice. You could also decide which dice to roll uses the chakra. Really, there are so many ways to use the dice it is quite fun. It is just another way to put together poses to get a yoga workout in, another way to practice. I like to use the dice because then I don’t really have to think about what poses to do. The way I have been doing it there is a little thinking as I need to arrange the dice that I have rolled into a sequence that makes sense for me, but you don’t even really have to do that if you want. As I said, there are so many ways to practice yoga it is up to you if these dice would be something you would like to do. I like it as it is just another way to practice. I will probably end up posting again about how to use these dice because the possibilities just seem endless. Can you imagine all the ways you can use this dice? This entry was posted on November 21, 2018 at 6:37 pm	and is filed under Yoga/PiYo/Pilates. Tagged: chakra poses, roll a yoga routine, yoga dice, yoga poses, Yoga Practice. You can follow any responses to this entry through the RSS 2.0 feed. You can leave a response, or trackback from your own site. I am so putting these on my Christmas list! I should have changed that title. Not good. This is a great thing to ask for for Christmas, plus a great thing to give. So fun!